Thursday was a day that I had been preparing myself for for quite some time now. The gray raccoon eyes had begun to appear through her reddish hair several years ago, proof of the passing years. But Dixie still remained an energetic, happy dog - always a puppy at heart. She would always be up for fetching her ball or a shake of her paw. She'd greet us with excitement, tail wagging, every time one of us would come through the back gate and would beg for a pat on the head as we made our way into the house. I could go on and on about her sweet personality and how she was so goofy and yet so smart at the same time - she always just wanted to please us. Over the last couple of years that energy started to fade little by little, but she always held up - she was a tough one. She had started to limp on her right leg, which we assumed was arthritis until one day back in May when Mom and Dad took her in for her normal check-up. The Dr. felt of her leg, which she could barely put any weight on anymore, and decided to do an x-ray. What we thought was arthritis turned out to be bone cancer - so advanced that He said she only had a few days to a few weeks left. We wouldn't have tried to intervene at all, even if we had known sooner - she was 14 years old and treatment would've been hard on her and probably futile at her age. I came into town that weekend to see her. She didn't seem like she was only days away from passing - she still had enough energy to get up and wag her tail and seemed very much like her normal self. Mom and Dad kept a close watch on her. The last thing any of us wanted was for her to suffer. She seemed to be ok until Wednesday when I got a call from Mom at work. Dixie wasn't getting up at all, wasn't wagging her tail anymore and wasn't eating. Since she stopped eating, they weren't able to give her pain pill to her, which meant she would soon start to suffer. She was nearing the end - not eating is a big sign of that, and although I would have much rather let her go on her own, it could take a couple of days, and she would likely be in pain. We decided to take her in the next day if she made it through the night. I headed to Sherman that evening after work to see her and go in with her the next day. My sister, Sarah was there as well that evening. When I got there, they had made a pallet for her to lay on, and the four of us sat around her in lawn chairs for the next few hours. I'm not sure if she was aware that we were there, but throughout her life, it was evident that she liked to be near us, so I hope that it brought her some comfort. The next morning when I woke up, Mom and I went out to check on her. She was still with us, so we made plans to take her in later that morning. When the time came, Dad picked her up and put her in the back of their SUV. I sat in the back seat so I could be near her. On the way there, she raised her head so she could look around and seemed a little more like herself - she always did love car rides. I had to remind myself that what we were doing was the right thing. I was glad that I got to see her perk up a little like her old self one last time. When we got there, they just had us pull around back where we waited in the car. I thought they would take her inside, but the Dr. came out to us and decided to do it there in the car. I was really glad that he chose to do it this way. It allowed us to have some private time with her without a cold Dr.'s office setting and strangers around. Most of all, she was not disturbed, as moving her again would have been uncomfortable for her. I hopped into the back with her and held her face close to mine - I just didn't want her to feel alone in that moment. Within seconds, I saw her body relax, and it was over. It's interesting, there have been a lot of people in my life pass away - grandparents, family and friends, and never once have I witnessed it in person. This was the first time I was there for that moment. After seeing this process firsthand, I would never hesitate to do the same for another pet if it came to it. It was very peaceful, quick and painless. Though it was hard to lose her in that moment, I am so grateful that she did not suffer. I have often wondered if our dear pets will be there to greet us when we get to heaven. I'd like to think that heaven is big enough for them too. I think that if God chose to give them to us here as companions, to bring us joy and love and to bring Him glory as the rest of His creation does, why wouldn't he include them in His paradise? Maybe I'll see her again. 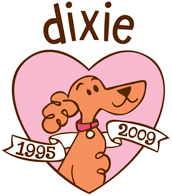 Until then, I'll think often of the best dog anyone could ever ask for....my sweet DixieBelle. One of the last pictures I took of Dixie on Thursday before we took her in.